Made by Melanie: KwikSew 3880 - me likie! My first time sewing with a non-Indie pattern since I started sewing about three years ago (year 10 sewing class not included) and it all went really well! 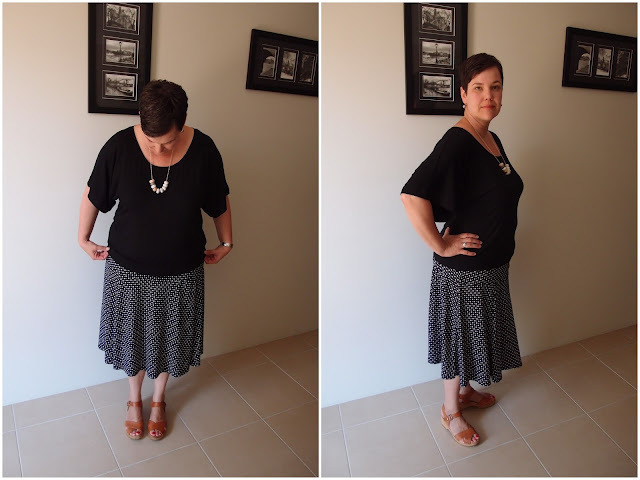 I first became aware of KwikSew 3880 after seeing it on Blogless Anna's blog and really liked the shape - fitted at the waist but blousy at the sleeves and bust...perfect for wearing with floaty skirts. I'll definitely be making this again! I went with my usual strategy and sewed the biggest size (an XL) but laid my Maria Denmark Kristen Kimono Tee pattern over it to see if the sizes were similar (they were). I didn't want the top to be overly long so sewed the M for the length. Next time I'm going to raise the neck though as it does feel a bit big and low cut. The neckband topstitching, hem and sleeves are all sewn with a straight stitch (using a longer length for the neck and hem to avoid popped stitches). I'm really liking this technique - much more tidy looking than a zig zag. I really like this top - the fabric is super cool and breezy (from Pitt Trading - need to get my hands on MORE) and this is a great top for wearing to work before the weather really heats up! So, yay, for finding another "go to" pattern that's simple to sew and totally my style. Modifications: I doubled the width of their skinny skinny neckband. I didn't read the instructions at all so perhaps it was meant to be a binding or something?